Bring the water, butter, salt and sugar to the boil, reduce the heat. Mix the flour and cocoa powder, add all at once, stir with a risotto spoon for approx. 2 mins. until a smooth dough is formed which separates from the base of the pan. Remove the pan from the heat. Using the dough hook on a hand mixer, gradually fold in the eggs; the dough should be soft but not runny. Spoon the mixture into a piping bag with a serrated nozzle (approx. 14 mm in diameter). Pipe 30 éclairs (approx. 8 cm long) onto a baking tray lined with baking paper, ensuring they are well spaced out. Approx. 25 mins. in the centre of an oven preheated to 180°C. Do not open the oven during baking! Then switch the oven off and leave to dry for approx. 15 mins. with the door slightly ajar. Remove, leave to cool on a rack, cut the éclairs in half crosswise using scissors. Heat the cream in a pan, remove the pan from the heat. Add the chocolate, melt, stir until smooth, then leave to cool. Whip the cream until stiff, fold in, cover and chill for approx. 2 hrs. Transfer the mousse to a piping bag with a smooth nozzle (approx. 1 cm in diameter). Heat the cream in a pan, remove the pan from the heat. Add the chocolate, melt, and stir until smooth. Cover the ganache and leave to cool, transfer to a piping bag with a smooth nozzle (approx. 5 mm in diameter). 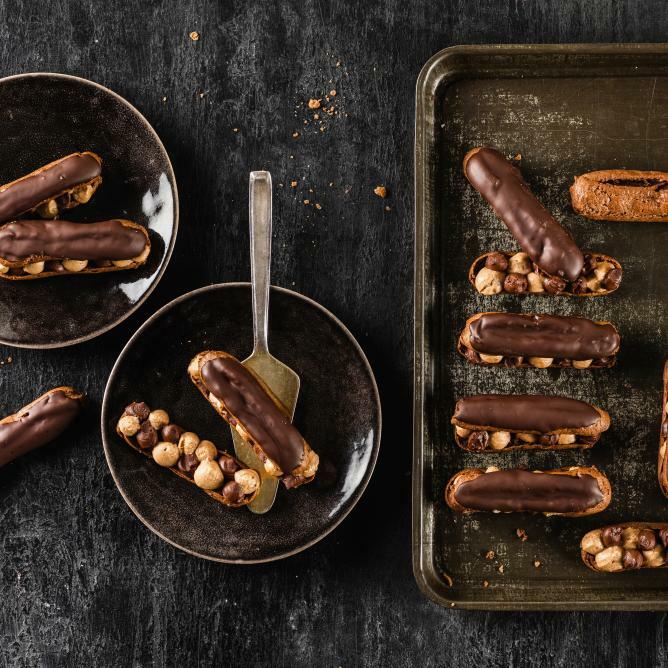 Pipe the ganache and mousse in alternate layers over the base of the éclairs. Melt the chocolate in a thin-sided bowl over a gently simmering bain-marie, stir until smooth. Glaze the top half of each éclair with chocolate, place on top of the bottom half. Instead of bars of chocolate, use chocolate bunnies left over from Easter.